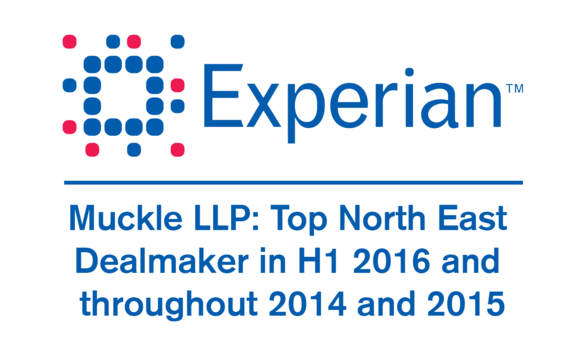 The most active North East legal advisers of H1 2016 have been revealed by information services provider, Experian. They place Muckle LLP in pole position once again, having previously ranked us as the top dealmaker in 2015 and 2014. In Half 1 of 2016, we advised on more mergers and acquisitions of businesses valued above £500,000 in the region than any other law firm. We are proud to have held this position for two consecutive years. The Experian Results (on page 39) demonstrate that our deal volume was nearly double that of our nearest competitor. This is a fantastic achievement for the Corporate Team at Muckle. Once again, thanks must go to our excellent team here at Muckle LLP and all the clients and business partners who we have worked with during the last year. We look forward to a busy Half 2. Please contact Andrew Davison on 0191 211 7950 or any of our team if you think we can help.